A second restaurant from the Monkeynuts brand was opened on Whetstone High Road, North London in April 2015. The latest venture from restaurateur Gideon Joffe, also owner of Chooks in Muswell Hill and Chez Bob in Belsize Park, is styled as a retro American steakhouse and wine bar with bench seating, vintage posters and ceiling fans. While the focus is naturally on steaks, burgers, hot dogs, sweet potato fries and craft beers, the menu also features salad, grilled chicken and salmon, ribs and fish tacos. 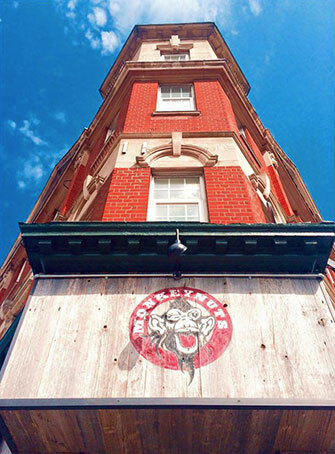 The first Monkeynuts was launched in Crouch End in 2004, and quickly became the area’s go-to place for all ages and groups looking for a ‘good food, good value’ menu in a lively, fun atmosphere. Sound Division installed the music system at the original Crouch End restaurant and were once again asked to provide a service for the new branch. The former occupiers at the Whetstone site had also been a restaurant and the existing Bose Freestyle speaker system, whilst working fine, was much in need of a service refresh. A new Cloud MPA240 amplifier mixer was also specified to take over the sound management of the system installed into the manager’s office and a single, remote volume control panel was secured behind the main bar for local volume control. Gideon Joffe has announced that a second Chooks is to open in Ealing, West London in October 2015 and another Chez Bob restaurant is also planned within the next eighteen months.